The more the merrier -- such is the life of Banzz. For the 28-year-old YouTuber, it is all about “more”: He eats more than practically anyone, has more followers than most other content creators, and grows more famous each day. Banzz has a “meokbang,” which can be translated into “eating show” in English and is a form of entertainment where the host communicates with viewers while eating in front of the camera, often livestreaming. Taller than he may appear on screen, Banzz seems polite and reserved, yet larger than life, as he sits for an interview with The Korea Herald. As one of the original “eaters” who popularized the word meokbang around the world, and now inarguably the broadcaster others in the medium look up to, Banzz is one great eater. He can put away 17 bowls of jjajangmyeon, 11 hotdogs with sides or 10 packs of instant ramen with rice added like it’s nothing. But he doesn’t push it -- relatively speaking -- and that’s what makes him stand out. “I do not like feeling too full. I eat just as much as I can handle,” the content creator told The Korea Herald at the DIA TV Studio in Gangnam, southern Seoul. He is a senior partner creator at CJ ENM’s DIA TV, a networking agency for content creators. Appearing more at ease as the interview carried on, smiling while throwing unexpected jokes here and there, Banzz said he was always firm about what he could and couldn’t do. For instance, he won’t eat more than he can handle just because the viewers ask him to. “There will be no end to what people want. If I eat one more (instant) ramen, they will ask me to eat two, three or four more,” he said. Pushing himself beyond his limits would eventually make his videos seem forced, which in turn would be a disservice to his followers, he said. Though a big eater, Banzz is beyond fit. Armed with lean muscles, there is not a hint of extra fat on his body. The secret is his extensive workout sessions, which take place two or three times a day. He works out 10 hours a day on average, a testament to how seriously he takes his job. While most people work out to wind down after a day of work, Banzz works out to be able to do what he loves. Being so fit has also given rise to misunderstandings. He was once rumored to have bulimia, with some viewers accusing him of throwing up on purpose when he left his seat for a few minutes during a live show. Since then, he never leaves his seat until the broadcast is done. “It is also part of the reason that I had decided to star in ‘LAN Cable Life’ on JTBC, to show myself more, including my workouts,” he said, referring to his latest TV project, which features content creators behind the scenes. Joining the program has lifted him into the ranks of the top entertainers in Korean pop culture, a career jump that perhaps may even seem undesirable to his loyal viewers, who enjoy the “intimacy” of social media. Banzz is indeed one of the biggest players in the still-burgeoning sector, with nearly 2.8 million followers and some 500 million views. The meokbang star is a walking enterprise too. He has 14 employees working for his video upload and dietary supplement business. He has recorded sales -- including advertisements and product sales -- of roughly 1 billion won ($900,000). “People around me are now saying, ‘You chose the right path,’” he said. But that has not always been the case. “I started with two viewers,” he said. He started to eat in front of the camera in May 2013 to train himself for a university interview. In contrast to now, he was not much of a talker at the time. “But I was confident about eating. It is in my family to eat a lot, too,” he said. 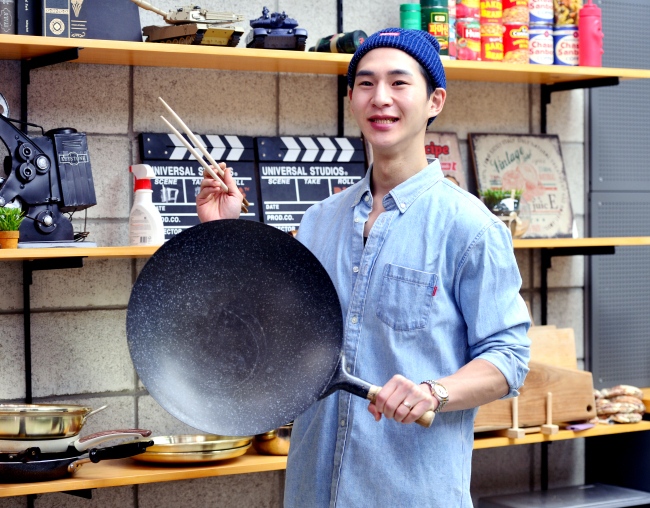 To cover the expenses for the eating show, he had to take all kinds of part-time jobs, working on a construction site and doing deliveries. His recent rise to stardom hasn’t fazed him or most of his followers, who cheer him on as he tries to stay grounded, he said. 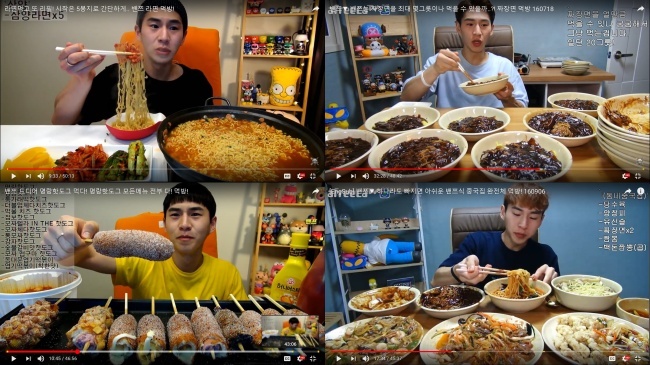 For the summer, he recently vowed to do a live eating show in his usual setting -- the house he shares with his parents -- every night throughout June and July. And he delivered. Banzz owes his success to more than simply eating a lot: He is well spoken and modest, yet humorously stern to his detractors, on top of being incredibly neat. He thanked his parents for cultivating this attitude. “My parents were very strict about being polite. They were friendly and warm, but when it comes to politeness, they were really strict,” he said. Banzz has a tight schedule. He sleeps just two to three hours a day on average. To exercise, attend business meetings and host a live show every day, that can’t be helped. But Banzz says he would never give up on going live. As to his future plans, Banzz said he wants to be a “good person.” That goal may sound naive, but he clearly means it.